Thousands have taken to the streets in recent weeks against the 82 year-old’s bid for another term in office. ALGERIAN PRESIDENT ABDELAZIZ Bouteflika has announced that he will drop his bid for a fifth term in office following weeks of protests against his candidacy. The country’s official news agency, APS announced that the 82 year-old would not serve a fifth term in office, implying that the president would remain in office until his current term expires on 28 April. It follows widespread protests in the north African country in recent weeks, with tens of thousands taking to the streets to demonstrate against his bid for another term in office. “There will be no presidential election on 18 April,” the veteran leader said, adding that he was responding to “a pressing demand that you have been numerous in making to me”. He also vowed “to hand over the duties and prerogatives of the president of the republic to the successor freely chosen by the Algerian people”. This evening, Algerians took to the streets in celebration, and honking car horns and singing rang out in the capital Algiers following the news. “Peacefully, we have overthrown the puppet!” people sang in the streets of the city centre. Former colonial power France also welcomed the president’s decision. “France expresses its hope that a new dynamic that can answer the deep aspirations of the Algerian people will rapidly take hold,” the country’s foreign minister, Jean-Yves Le Drian, said in a statement. On Monday barristers across Algeria had joined strike against Bouteflika’s bid for a fifth term, demanding the Constitutional Council rejected his candidacy on grounds of “incapacity” to carry out the role. Bouteflika’s rare public appearances since a stroke in 2013 have been in a wheelchair, and he returned to Algeria on Sunday after spending two weeks at a hospital in Switzerland. His return from hospital in Geneva came as protest strikes shut down the capital’s public transport system and many schools across Algeria on Sunday. Bouteflika became president in 1999, and he has clung on to power despite his ill health. Dubbed Boutef by Algerians, he had helped foster peace after a decade-long civil war, but he has also faced criticism for alleged authoritarianism. 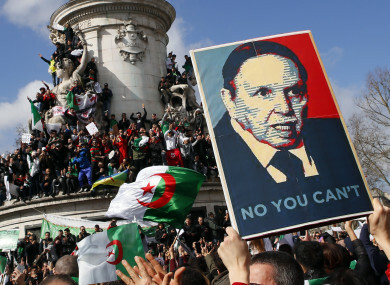 When the Arab Spring uprisings erupted across the Middle East and North Africa, Bouteflika’s regime smothered dissent and played on fears of a repeat of Algeria’s civil war. He was elected for a fourth term in April 2014 with 81.5 percent of the vote, despite not campaigning for election. Bouteflika also has a history of medical problems, and has often flown to France or Switzerland for treatment. Email “Algerian president to drop bid for fifth term in office following weeks of protests against his candidacy”. Feedback on “Algerian president to drop bid for fifth term in office following weeks of protests against his candidacy”.